I have heard about Zumba for so long, and I always thought it sounded like fun, but I have no rhythm and I'm a horrible dancer, so didn't even want to attempt it! Well, last year my friend, Melissa, asked me many times to go with her. I gave her so many excuses as to why I couldn't, she finally quit asking me! But I finally decided I wanted to give it a try, so I asked her to join me, and she did! I didn't get any pictures, so I just borrowed this one. It was SO MUCH FUN!!! It'll take me going several times to learn all the moves, but it was an excellent workout! You know I've complained about the boring boot camp instructor, well this instructor was awesome!! She was fun, happy, energetic and full of life! I also loved that she pushed us- as we're doing burpees, she says don't stop now, squats- hold it a little longer, keep your arms up, etc. She was very encouraging! I was nervous and worried about looking stupid, but ya know what? Who cares!! Nobody was watching me anyway, and even if they were, they had to learn it too! This is definitely a class I'll be taking again! 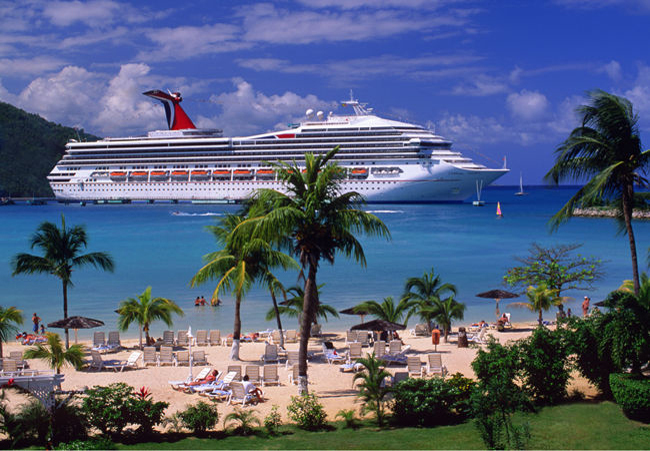 On another note...15 days until I sail away! I think the last time I was this excited was on my wedding day!! Of course I had to check out their fitness options! 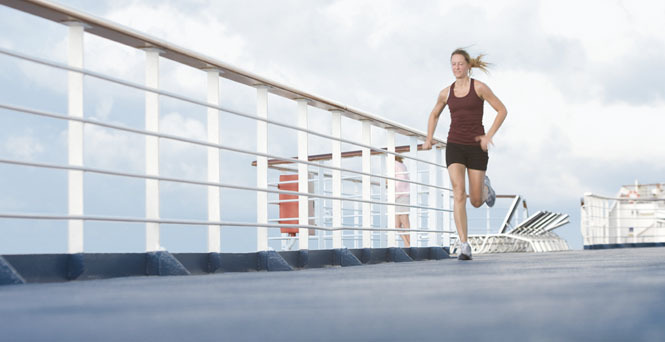 There is a jogging track that goes around the ship. How amazing will it be to run here!! They also have a gym and some fitness classes too. QOTD: Have you ever taken a Zumba class? If so, did you like it? It's fun to do! you sweat alot.. dont dont feel like your working out! It was so much fun!! It really didn't feel like a workout, until the burpees! I know exactly what you mean, even a year ago I wouldn't have ever thought about doing any type of fitness on vacation!! But now that's one of the first things I think about! Definitely try Zumba sometime! I've never taken Zumba, but it looks like so much fun! A bunch of my friends have tried it and love it. So glad you had a great class! You should try it, Maureen! It's awesome! Especially if you have friends to do it with. I have not tried Zumba but I would like too for sure! Funny how what we look for in vacations have changed! Now when I plan vacations I too look for fitness options too and if you would have ever EVER asked me if this was going to me part of my vacation planning before I would have laughed in your face! Omg, I KNOW it!! Even a year ago that would've been the last thing on my mind! Vacation is to relax, not workout! Wow, how things have changed. Now that's one of the first things I look for! I loved Zumba the last time I did it! can't wait to get back into it! Glad you liked it! I also am completely uncoordinated.. and when I take classes like that I always stay in the back! Lol.. but it's fun.. and the best part is that no one else really cares, so why should you? It's just a way to get your body moving for an hour, and it's a good work out! I stayed real close to the back too! Once I get better, I'll probably move up towards the front. It is an awesome workout! Wow..I'm sure running on 'that' track will be so awesome. *Jealous* Where are you sailing to? I did 9 zumba classes when I was visiting my parents last year. Man--its fun. A workout which truly is fun! It will be awesome! We're going to Nassau and Freeport, The Bahamas. I'm ready to get out of this cold weather! I did Zumba with a friend while living in Texas. Our husbands were deployed so it was nice to get out there and workout with a friend. I'm not a dancer or girly girl AT ALL. I'm more of a metal head. And I had the same reservations you did -about having zero rhythm. But I really liked it! We had a great teacher, she encouraged you to do it at your own level and just have fun. Personally I took it to more of a fitness level (jumping, squatting, doing push ups, when we didn't have to) and overall I thought it was a great way to burn some calories without feeling like you are "working out". After I did it for awhile I actually got pretty good at it... but I still don't considet myself graceful! Zumba is definitely a let-loose and FUN time!! It sure is! That's definitely how I was too. It is fun though! I LOVE, LOVE, LOVE, LOVE, LOVE Zumba! I am so glad that you enjoyed yourself! Dancing classes can be intimidating, but letting go and having a good time ALWAYS wins! :) I'm totally jealous of your upcoming cruise! 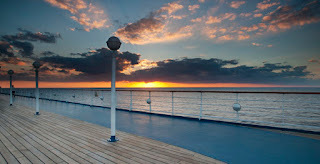 I would LOVE to run around a track on the deck of a ship! AWESOME! Thanks to you for calming my nerves and encouraging me, darlin!! I'll definitely be back! I am so excited about running on the ship! (That seems so weird to say that!) I'm sure it'll be an awesome experience! I have never take a Zumba class. I've been told multiple times I look like I'm in pain when I dance. Lovely. Oh no! Lol! I'm sure I would be told the same thing! I have obviously never taken a Zumba class because what?! I didn't know you do Burpees and squats in Zumba. I thought it was all dance! How exciting! I've never done a Zumba class but they look like so much fun. I'm SUPER excited about your cruise!!! Zumba is hilarious. 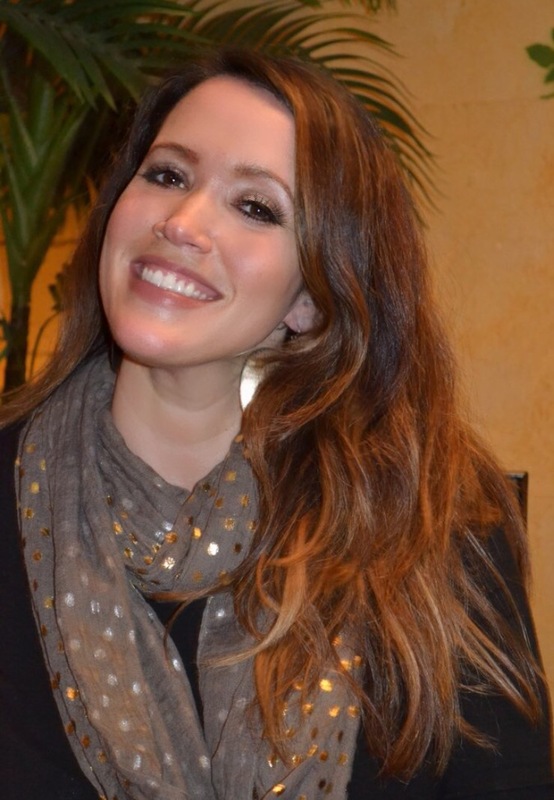 I take a class every now and again when I need to get some good smiles and energy going! I'm terrible at the moves, but I still have a blast. I've never taken a zumba class. Fitness class, in general, are very intimidating for me. I'm so jealous of your upcoming cruise! 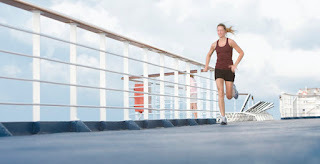 How fun to run on the ship. Can't wait to hear all about it! Glad you had a great time with Zumba! I've heard it's a really fun class. are ann expert on this subject. Fine with your permission allow me tto grab youyr feed to keep updated ipadair3i forthcoming post. Thanks a million and pleasse keep up the gratifying work.